While young Romeo Beckham (12) is certainly going to A�be a heart-breaker, Brooklyn, his older brother has only just A�broken out of his shell and how! 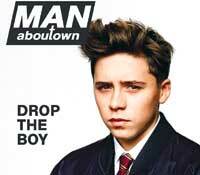 At 15, Brooklyn is already on the cover of the Spring/Summer 2014 issue of Man About Town. With his muma��s (Victoria) poker face and his fathera��s (David) physique, the camera seems to love his intense A�looks and almost-scowl. Although vastly different A�from the smiling and vibrant Romeo, both of them A�seem set to take on their parentsa�� legacy. A�Next up, Cruz control, we imagine. Marie on the cover of People magazine when she was born. Keough (who goes by the name Riley Keough), has been part of major Christian Dior fashion and perfume campaigns as Miss Dior Cherie after her modelling debut with Dolce and Gabbana. Also seen in films like Magic Mike and most recently in Justin Timberlakea��s video TKO, playing a bitter girlfriend, she also models on occasion for Lee. All this when shea��s not shooting for the cover of Vogue, with mother and grandmother Priscilla, 15, Keough recently got engaged to Ben Smith-Peterson. A spitting image of her gorgeous mother Cindy Crawford, Kaia, all A�of 12, has already made her foray into modelling. As the face of the Versace Kids line, she looked all set to secure her place as a model, A�until her mother put her new found career on hold a�� at least temporarily. But Kaiaa��s brother, Presley, is more than gifted behind the lens, goes A�trigger happy on family vacations, taking snapshots of his sister who is only too glad to pose for the camera. The duo looks set to take over A�the fashion industry. But wea��ll have to wait for them to turn A�a bit older, as mother wona��t have it any other way! Quite literally the model son, Jude Law and Sadie Frosta��s offspring, Rafferty A�Law, has his fathera��s dashing looks and knows how to strut his stuff. The 17-year-old was first seen as a ramp model for DKNYa��s fashion show in London, three months ago. Soon after, he graced the cover of mena��s luxury lifestyle magazine D Section, posing alongside fellow male models Oliver Cheshire, True Blooda��s Giles Matthey and English judo athlete, Ashley McKenzie, for the black and white shoot. The story was about their personal heroes, and not surprisingly, Rafferty skipped his father, reserving the honour for Joe Strummer from the Clash. Not quite the model father, eh Jude? Twenty one years after Kate Moss first A�modelled for Calvin Klein, her sister Lottie A�Moss is doing at 16, what Kate did at 18 . Lottie, A�who shares the same father as Kate, has been snapped up by Storm Models, who incidentally A�also signed Kate in 1988. Lottie is part of the A�Calvin Klein Jeansa�� Re-Issue Project, which A�has rebranded iconic designs for this year in A�a limited-edition series. While already on the cover of Teen Vogue in April, this young girl has her sights set on Vogue. Something tells us shea��ll get there sooner rather than later.